Our Mission To Be Green starts in our office, which is based out of Riika Magnus’s home, a townhouse in a community that was built in 1964. Though they did not have the most eco-smart resources back then, since Riika purchased her house in 2007 she has made several improvements that include new energy efficient windows and zonal heating, with solid state thermostats. Being a home based business has cut our car usage to almost none! Growing up in a money-conscious family has ingrained the rule to turn off lights, and anything else, when you leave a room. 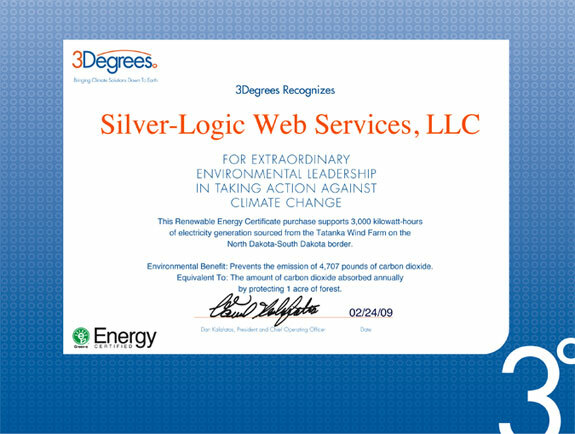 In February 2009 Silver-Logic purchased Renewable Energy Certificates (REC’s) to 100% offset our CO2 emissions! We purchased enough REC’s to cover our server’s power usage every year, plus what we use in our office. With any of our services you can feel proud to know you are doing something good for our environment by supporting existing wind farms and the creation of new ones that produce clean and renewable energy! If you would like to learn more about REC’s and to purchase please visit 3Degrees or any other certificate marketer. Starting May 2010 we now purchase our REC’s monthly directly from our local power company Portland General Electric. We also use paper-less billing anytime we can.